At 700 yards, a disk the size of a steering wheel looks like an aspirin, even at 9X magnification. That’s all the magnification I have. “Give it a minute left wind.” Tim knows this canyon; his calls get my attention. The trigger yields. Pow! Cycling the bolt prone, I’m thinking this exercise won’t let me see them print. My bullets will never be found. “Got it!” Tim is still in the spotting scope. A long second later, the faint clang floats back. “Same wind.” He expects a follow-up. I feign complacency. Another shot brings the same result. So do the next. Three is enough, I yawn. No sense courting boredom. It’s only 700 yards. O.K. I’m not bored. Eventually a gust will mug a bullet, and I’ll have to confess a miss. As it is, I can say all bullets from my 6-pound, entry-level .30-06 have smacked Tim’s small steel more than a third of a mile downrange. Factory ammo. Ordinary 3-9X scope. No, a .30-06 American isn’t an elephant rifle. But who can resist FTW’s dangerous game course? Full disclosure my fellow shooters: Though Ruger’s new American is so inexpensive even jobless grads moving back home can afford it, this rifle has much to offer veteran riflemen, too. And it actually weighs 6.25 pounds. 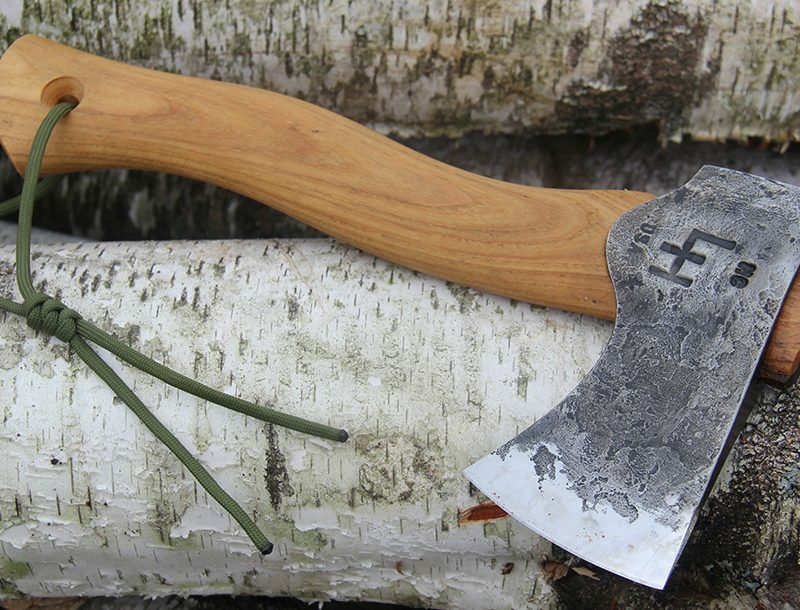 You might shrug off 1,000-yard steel as irrelevant. I don’t shoot at game 1,000 yards off—nor do most hunters, or the crew at FTW. 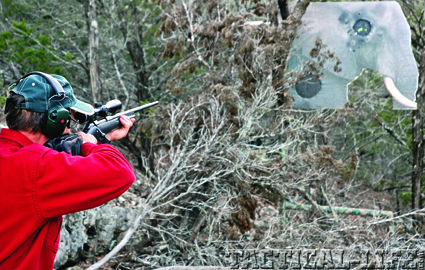 Doug Prichard, retired Navy SEAL and sniper instructor, points out that FTW’s animal targets “test you to 300 yards. That’s far. Your goal should be a lethal hit, not just a bullet in the animal.” Doug drills shooters from field positions. “Anyone can be a hero from the bench.” He recalled a “drop-and-shoot” course in which a third of 42 trained snipers missed with their first round at an 18-by-30-inch target—think double kitchen sink—at 427 yards. I coughed dismissively. Plumbing the depths. The bottom is getting crowded. Every factory that can cut an ejection port in tube steel and pull polymer from a mold is racing to beat the competition in a price war exacerbated by a rubber-legged economy. To be sure, even in good times a bargain makes me tingle, but the buzz of high quality lasts longer. At a street price of $400 or so, the American can’t deliver much—or so I thought. The rifle is, at first glance, unremarkable. 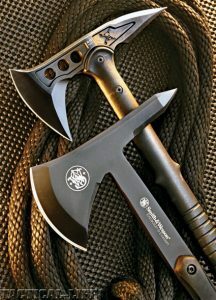 A blued chrome-moly steel receiver and lightweight, 22-inch, hammer-forged barrel rest in a molded black composite stock. The length of pull is 13.75 inches over a black, vented recoil pad. There’s no bottom metal; the triggerguard is part of the stock. A detachable four-shot magazine fits flush. The trigger is Ruger’s Marksman, adjustable from 3 to 5 pounds. It has a front tab that must be depressed for the rifle to fire. The tang safety does not lock the bolt. 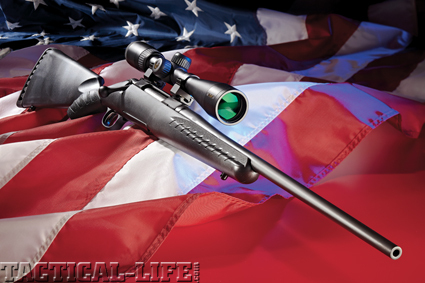 Ruger’s American comes in two action lengths: short for the .243 and .308, and long for the .270 and .30-06. Pretty ordinary. Look closer, though, and the picture brightens. The stock feels better than it looks, with a slim, open grip and deep fluting in back, a slender, rounded forend with comfortable concavity along the barrel channel. Ribs there and in the grip arrest but don’t chafe your fingers. The stock is lithe in hand, not at all clubby. Swivel studs are properly placed for sling use. While many recoil pads have firm edges and a soft middle, the American’s has compliant corners and a firm center. It absorbs the bump of a lightweight rifle without abrading skin or bruising your clavicle. The stock comb shrinks from even low-mounted scopes. But Ruger’s crew thought of that and supplies, at no charge, a lace-on cheekpad. Its right-hand side has a pouch and ammo loops. A Brownells Latigo sling helps the author steady a Nikon-scoped Ruger American from the sitting position. Here the company ran into a problem. To keep the rifle 100 percent American, it would have had to furnish a $40 cheekpad—too costly. At $20, an imported pad would work as well. The solution: Box the rifle with no pad and supply the imported version free when owners mail in the warranty card. Or, for a discounted price of $24.95, ship a cheekpad made in the U.S.A. “So that’s how it’s sold,” smiled Mark. At Doug’s urging, I tried a cheekpad with and without quarter-inch foam inserts. One insert puts my eye “on axis” behind the Zeiss 3-9×40 Conquest scope, whether I’m prone behind a bipod or using my Brownells Latigo sling. Incidentally, the American’s receiver is not dimpled for Ruger rings; instead, the company provides traditional Weaver bases with every rifle. With no trigger scale at hand, I can’t weigh the pull on the Ruger American I’ve been assigned. It seems a bit heavier than 3 pounds. But the pull is consistent, with no perceptible creep. Trigger weight has less influence on bipod-assisted prone shooting than on less stable positions. Still, I’ll give the Allen wrench a turn or two for an easier break. 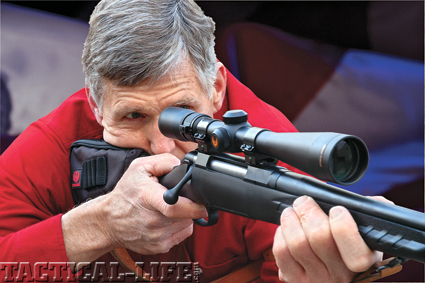 Svelte bolt guns become hard to shoot accurately as trigger pull approaches rifle weight. The tang safety slides smoothly but stops firmly and audibly, front and back. The American’s bolt is full-diameter behind the recesses for the locking lug abutments. You get smooth travel with minimum wobble at the end of the stroke. The rear stop is a spring-loaded tab that fits almost flush with the left receiver wall. Press it to release the bolt for removal. The three-lug bolt head delivers a 70-degree lift. Short lift helps your hand clear the scope and can speed up second shots. But low-lift bolts can be difficult to cycle from the shoulder. That’s because primary extraction must occur over a shorter distance, so the cam angles are steeper. 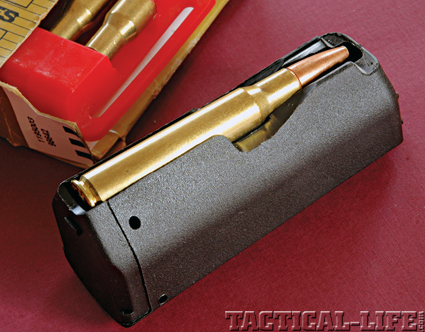 If you must lower the rifle to get leverage on the bolt you might as well have a single-shot! The rotary four-shot polymer magazine with contoured belly fits flush. It’s handy, silent and feeds quite smoothly. “We addressed that concern with dual cocking cams,” Mark told me. “Bolt lift on the American is about as easy as on twin-lug rifles.” I found it so, cycling and firing without lifting my cheek. The bolt-face extractor tugs cases free without a hitch; the plunger ejector kicks them unfailingly through the port. Cartridges slide eagerly from a polymer spool. That’s right: the four-shot box is of rotary design. It is easy to load outside the rifle, and it’s possible but not convenient to load from the top. The relatively small port impedes access. Contoured to match the rifle’s belly, the magazine is held by a forward latch that drops it conveniently into your hand. The magazine does not rattle. Insertion is easy; no need to wiggle the box into place. Interchanging magazines with different rifles, I found all functioned perfectly. Despite its light contour, the .30-06 barrel on the American I used at FTW shot very well. You might call its 700-yard performance a gift from the wind gods. But at 500, this rifle rings the gongs with monotonous regularity. I tried from a sling and hit. Three shots on a paper bullseye at 300 yards taped 2.75 inches. Aptly paired with a Zeiss 3-9×40 Conquest scope, it nimbly bounced from short to long distances and back. Zeiss’s turret got a workout—I dialed for elevation rather than use the busy range-compensating reticle. At distance, I dialed well beyond the 12-minute scale, backing off at the stop so recoil didn’t damage the mechanism at its limit. The reticle affords additional elevation. Over two days and many cartridges, with frequent sight changes, the crisp Zeiss adjustments proved absolutely repeatable. My last shot—with the dial 61 clicks from zero and an expert wind call from Doug—nailed a pie-plate gong at 500 steps. Back home, I unbox another Ruger American, scope it with a Nikon ProStaff 4-12X scope and fire five groups with factory ammunition from Federal, Hornady, Norma, Remington and Winchester. Hornady’s 165-grain BTHP drills a 0.8-inch knot, and Federal 180-grain Trophy Bonded bullets shoot almost as tight. Norma-loaded AccuBonds stay near an inch. No groups exceed an inch and a half. 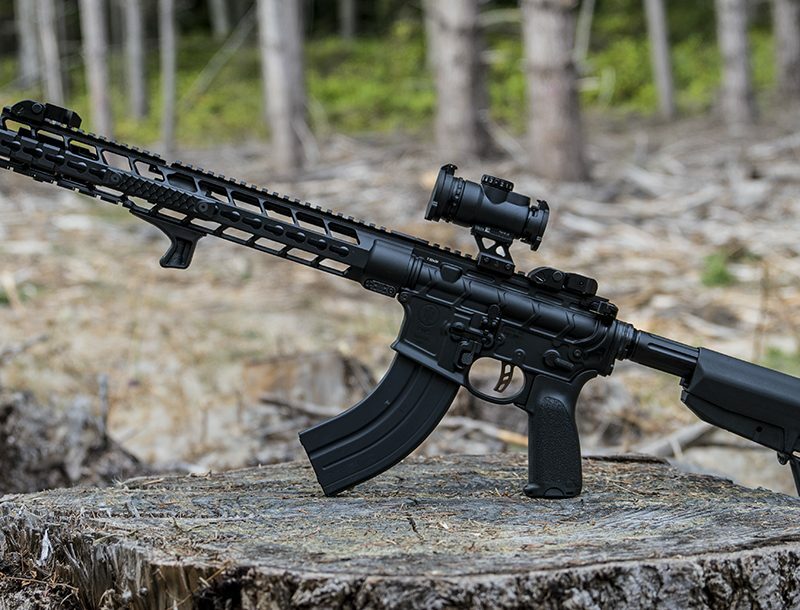 This new Ruger rifle feels, functions and shoots above its pay grade. Once you get past the “entry level” label every scribe must stick on bolt guns of this price, you’ll find the American a worthy choice for veteran shooters, too. Addicted to figured walnut? The American qualifies as rehab. 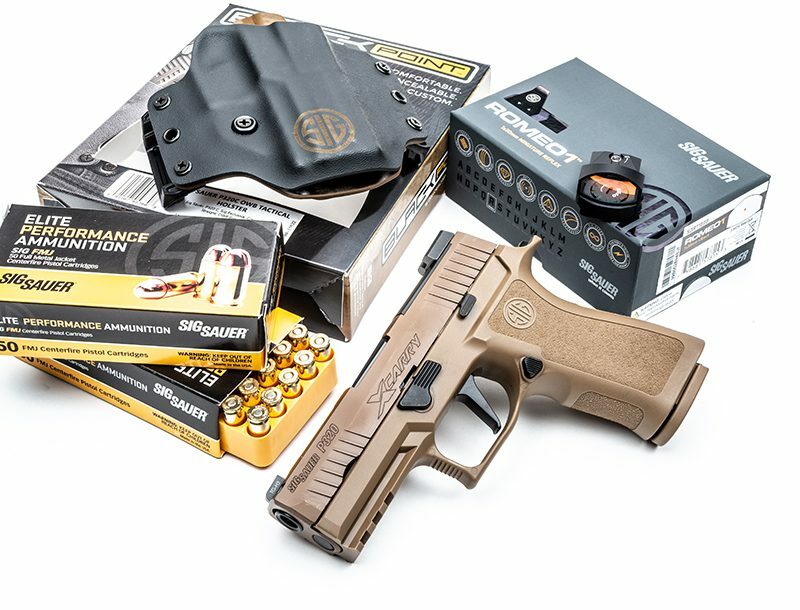 For more information, visit ruger.com.